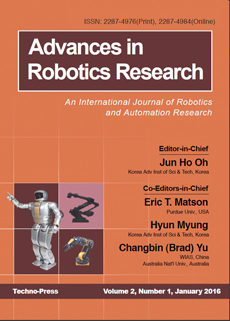 The "Advances in Robotics Research" aims at providing an integrated source of information for academics and engineers in the field of Robotics and Automation. With a wide variety of topics covered by the journal, the readers may be benefit from an integrated single source of information to know the current developments in the allied field and to use it in future research and application. South China Univ. of Tech. Westlake Institute for Advanced Study(WIAS), Australia Nat'l Univ.